Pity the poor hyperpower, flummoxed by Putin’s decision to give Snowden temporary asylum in Russia. Indeed, pissed! Okay then, I’ll take my marbles and go home! No summit with you! I try to stay mostly clear of obvious political headlines, but couldn’t resist this story, and its picture worth a thousand words. This photo is from two months ago, at the G8 summit in Northern Ireland, but it nicely encapsulates a point I tried to make this morning after the White House announced that President Obama was “postponing” his upcoming one-on-one meeting with Russian President Vladimir Putin. The Obama administration’s “reset” with Russia has been falling apart over, among other things, NSA leaker Edward Snowden winning temporary asylum in Russia. But this may be less a product of conflicting interests or divergent ideologies – two things far more endemic to the U.S.-China relationship – than the simple fact that the stakes in the U.S.-Russia relationship are too low. The two leaders just don’t feel compelled to force a smile and push through their differences, as Obama does with Chinese President Xi Jinping, or previous American and Russian leaders did throughout the far-tenser Cold War. That’s why I’d pick the above photo, from G8, to explain the relationship: The Obama administration has simply not appeared as interested in working on the reset in the last few years, maybe in part because of how difficult it’s been and how little they may believe they have to gain relative to their efforts. They’ve kind of moved on. Obama would rather chat with U.K. Prime Minister David Cameron than try to coax a friendly moment out of Putin, because what’s the point? Putin has made his own occasional gestures toward compromise and cooperation – recall his earlier statement that Snowden could stay only if he promised not to hurt “our American partners” – but he’s also appeared more preoccupied with the U.S. than Obama is with Russia. His push for banning American families from adopting Russian orphans, for example, looked at least in part like an effort to promote nationalist sentiment at home by playing up the big bad American threat. 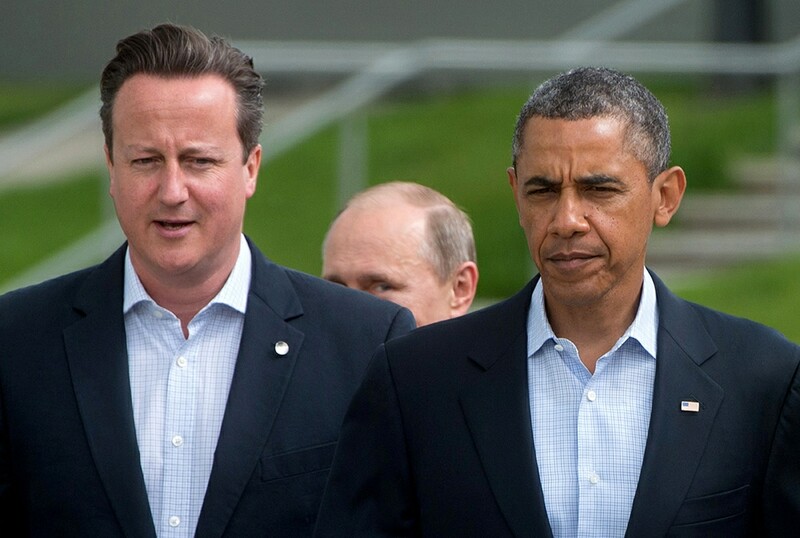 The above photo, of a lone Putin appearing as if ready to photobomb Obama and Cameron, captures that approach nicely. 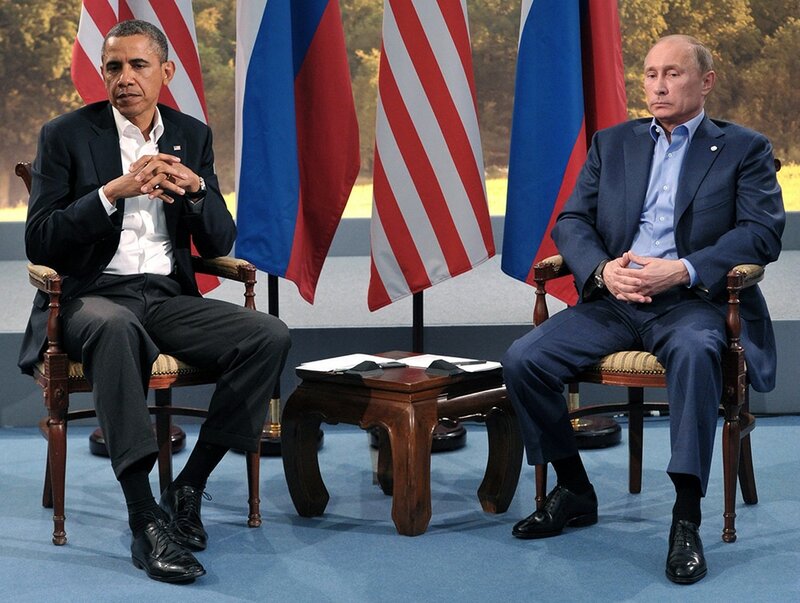 Many readers might have expected that I would have chosen, as a photo to sum up the Obama-Putin relationship, this more popular selection, posted below, from the same conference. This photo is pretty great – neither of them looks at all happy to be there, and the silent, sullen resignation on their faces could be a nice metaphor for the current status of the reset. But this photo might better describe the relationship a year ago, when they would at least still appear on the same stage together. Don’t count on them doing any joint photo ops at the coming G20 summit, which is when they were supposed to meet one-on-one. If we’re lucky, though, maybe Putin will try to photobomb Obama again. Subscribe for the WorldViews daily email update to get the latest headlines delivered to your inbox. This entry was posted in 2013, dark doo-doo, Reality Ramp-Up. Bookmark the permalink.